A Rio Paralympics hopeful has paid tribute to the role Papworth Trust has played in helping him achieve European glory. Wheelchair basketball star Lee Manning was part of the Great Britain squad who were recently crowned kings of Europe for the third time in a row. 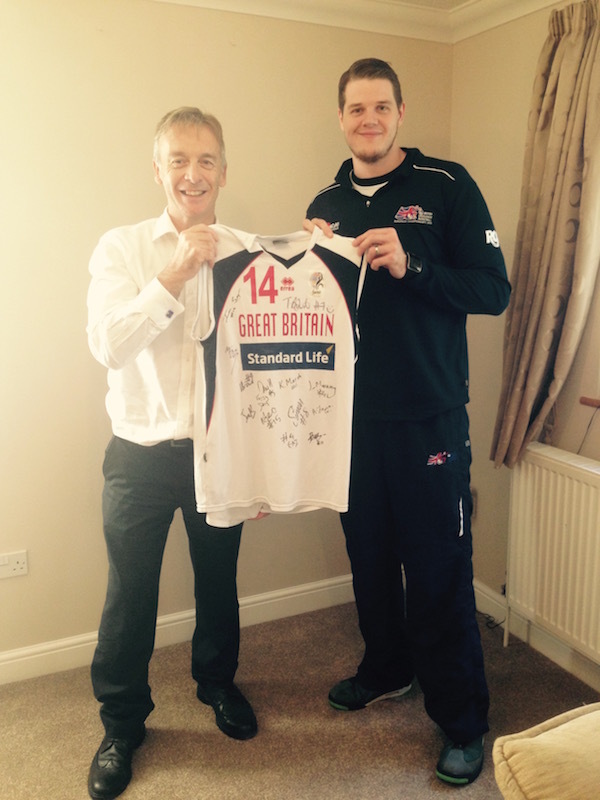 To thank the charity for their role in his sporting development, Lee donated his signed British shirt to Papworth Trust who sponsored him for two years in the build-up to the 2012 Paralympics. Lee, 25, said: “If I hadn’t had the financial support from Papworth Trust, I wouldn’t be where I am now. Originally from Peterborough, Lee, who has bilateral talipes or club feet, now plays professionally in Spain having benefitted from Papworth Trust’s Paralympics sponsorship scheme in 2009. Though he narrowly missed out on the final team for London 2012, being named as first reserve, Lee has bounced back to achieve European glory at the recent championships. A qualified Grade 2 wheelchair basketball coach, he is now targeting the Rio games next year but admits the standard in the squad is high. David Martin, director of external relations, said: “Papworth Trust is delighted to have played a part in Lee’s sporting achievements. Papworth Trust offers essential support and care to disabled and older people, their families and carers. We help people of all ages to live independently in their own homes, to learn new skills, and to find and keep jobs that are right for them. To find out more about the charity please go to www.papworthtrust.org.uk. Be the first to comment on "Rio hopeful thanks Papworth Trust for sporting support"